I received the following email earlier from The Freedom Association about the EU flags being dished out at The Last Night of the Proms. I thought that the Remoaners trying to ruin the Last Night of the Proms by waving EU flags would make my blood boil. After all, nothing angered me more, during last year’s EU referendum, than Harriet Baldwin, the Conservative MP for West Worcestershire, putting a Vote Remain t-shirt on the statue of Sir Edward Elgar in Malvern. Unlike her, I would not presume to know how that great man would have voted, though the fact that he was a fiercely patriotic right-wing Conservative might serve as a clue. But Harriet Baldwin, like so many Remainers, was as clueless about Elgar as she was about her own constituents – Elgar’s beloved county voted heavily for Leave. So why did those promenaders frantically waving their EU flags not make me angry? In truth, I felt rather sorry for them; they looked so ridiculous waving their alien flags during that great English hymn, Jerusalem. They looked as out of place as people turning up to Ascot in shorts. What made me grateful to these Remoaners was the contrast between the ‘in’ crowd of metropolitan types under cover in the Royal Albert Hall and the vastly bigger and more representative crowds of ‘ordinary’, patriotic Britons singing and cheering in Hyde Park and in a typically rain-soaked Swansea. There I struggled to spot a single EU flag. They waved their Union Jacks and English and Welsh flags with gusto. And, even in Glasgow and Northern Ireland, the Prom crowds had spurned the opportunity to sport the yellow stars of the EU. It was a reminder of why the vocal, pro-EU, metropolitan elite lost the EU referendum last year. Thank you for that, Remoaners. Then, as now, the bulk of the British people voted for the country that they can and do believe in, rather than the European superstate that they either detest or fail to connect with. Sibelius – and his fellow countrymen – didn’t hate foreigners, any more than we hate great Germans such as the magnificent Prince Consort after whom the Albert Hall is named. They simply wanted the right to control their own destiny, as we Brexiteers do. We are about to escape the shackles of the anti-democratic European Union to return to the ranks of free and independent nation states. Our land of hope and glory is indeed the mother of the free. Once again, we can set our sights beyond Europe; wider still and wider shall our bounds be set – a champion for free trade throughout the world. So thank you again to those Remoaners in the Royal Albert Hall for reminding me of why Brexit is happening and why, when it is achieved, we really shall have something to sing about. 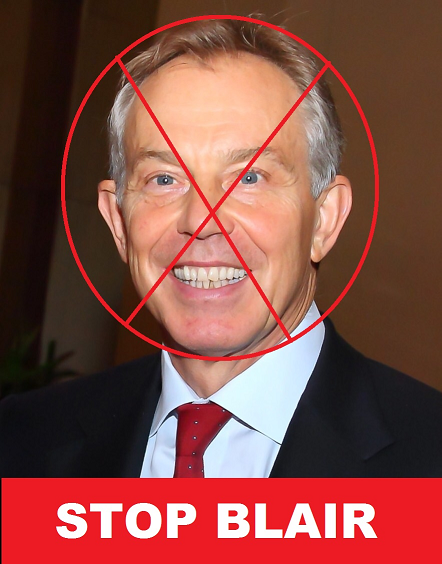 Can you help The Freedom Association to stop Tony Blair? This entry was posted in BREXIT, The European Union (EU) and tagged BREXIT, EU, Stop Blair, The Freedom Association. People have woken up to the trickery of the corporates ego paid for brexit and will hammer the ordinary folks working lives. Nobody forced flags into anyone’s hands and they wave them with their own will. The will of the people is not a single snapshot. It evolves. Leave won a battle but not the war. And now it is being pushed back to it’s core. The ‘Corporate egos’ were all backing remain, both with propaganda and cash. They lost. Ordinary folks are the ones most affected by the EU, be it in increased fuel prices caused by ‘green’ regulations, higher food prices caused by the CAP and common tariff barrier and by the cost of rents rising whilst wages drop caused by unlimited free movement of people. ‘Project Fear’ is carrying on because the EU desperately need us to stay for both their coffers and the jobs of the German and French car workers and farmers – like they did to the Irish over Lisbon, they desperately hope that their propaganda and deep pockets can force a second referendum and a reversal of the vote. They will fail whilst England and the rest of the UK fulfil our 21st century destiny of becoming once more an outward looking, globally trading and free nation. And you, dear person, with your backwards views remind me of why we are fighting Brexit. For the good of our country, the country we love, this United Kingdom, we will not let you divide it. We will not let you drag it out of the union that has kept peace on the continent for the longest time in history. We will not let you drag the country back to the dark ages. We will not let you force this country into a fantasy land based on nostalgia for a world that simply does not exist anymore. And most importantly we will not sit idly by while the right wing use Brexit to take away our rights and to hand over basically unlimited power to the Prime Minister. You say we don’t like democracy? The PM is dragging it away from you right now with this bill being debated today in parliament while you sit by and cheer simply because you think destroying the country and the future of the young people of this country is a price worth paying to teach those dreaded fellow Europeans who live on the mainland a lesson. The anti Brexit movement is made up of many millions of people from all walks of life. Many single mothers from council estates, many people working long hours on minimum wage in manual jobs, many people with families who will struggle with the mess caused to thus country by Brexit, and yes the people from the cities you so despise simply because they have made an effort to move their lives forward while you wallow in your self pity and nostalgia. Yes there were people who paid a fortune for proms at Royal Albert Hall but there were also people who attended for less than £10. Students. Working class. Families. They were all represented there. They were all waving the EU flags you so despise. We are here to stay, not only because the end of freedom of movement will make it hard to leave, but because we believe in this country and we will fight for as long as it takes. You are just wasting our time because the UK will be in the EU, whether it be by stopping Brexit or by rejoining later on. The true patriots are those trying to save this country from the likes of you while you tear it apart. If you hate the EU so much, want to live in a country where individual views are not allowed, which doesn’t rely on the outside world, and which has no democracy then why don’t YOU leave? May I suggest checking out Regent Holidays. They offer trips to North Korea. The remain idea of a ‘United Britain’ is part of a United EU superstate with its own flag, army, monetary system and president – did you see President Juncker’s state of the union speech? We would not be a united country but a province of Brussels, run by the unelected for the benefit of big corporations and the political class. The peace you talk of was bought by NATO, not the EU. The only time the EU had to sort out a military situation in Europe was when Yugoslavia fell apart – their weakness and prevarication led to thousands of deaths and a UN peacekeeping force having to step in. The less said about their part in the Ukrainian uprising the better. BREXIT is about a vision for the future, not the past. A future where we take our place again as a globally trading, outward looking and free nation, not a part of an obsolete and inward looking closed market that turns its back on the rest of the world. In case you haven’t noticed, many on the ‘left’ were involved in the leave campaign including trade unionists, Labour MP’s and intellectuals. You talk of handing unlimited power to the prime minister but these are only the powers that were given away – I didn’t hear remainers crying about 3000 laws passed on to statute without Parliamentary debate or the Lisbon Treaty being enforced on us without a vote.Besides, we can vote out a Tory government and therefore the prime minister (Who can also go if her constituents wish to remove her) – you can’t vote out an EU Commissioner or President. Where is the democracy in the EU where the MEP’s are just window dressing and the regulations are decided by the unelected Commission? We have even seen votes in the Parliament conducted where MEP’s can only vote ‘Yes’ or ‘Abstain’. They cannot initiate legislation and they can’t block it, only amend. I don’t despise people who live in cities – I am one of them. One who has seen my rent go sky high because of lack of housing, in large part driven by population increase through uncontrolled migration.I have neighbours from many parts of the world and they moan about EU free movement far more than me, like the Polish HGV driver who now has to take in a lodger to pay his mortgage because an oversupply of cheap, poorly skilled drivers has driven his wages down. Or the Chador wearing lady who approached me on a street stall on Referendum Day and said she was voting Leave because she wanted proper migration controls because free movement is allowing in people who give her a bad name. Those £10 tickets were for Proms in the Park – there were far more Union flags than EU flags there, I wonder why? I believe in this country and that is why I believe in Leave – you obviously believe in a Britain that is 1/28th of a new ‘United states of Europe’. I believe that there is a whole world outside the insular EU and we should be engaging with it as equals whilst retaining friendly trading relations with those remaining inside. I believe in a strong country fit for the 21st Century – but if you wish to keep us in a failed 20th century protectionist and isolationist bloc then you will fail in the face of the optimism and drive of the 17.4 million.